Wait…what? Yes, you read correctly. I did the Goofy Challenge again…by accident this time. 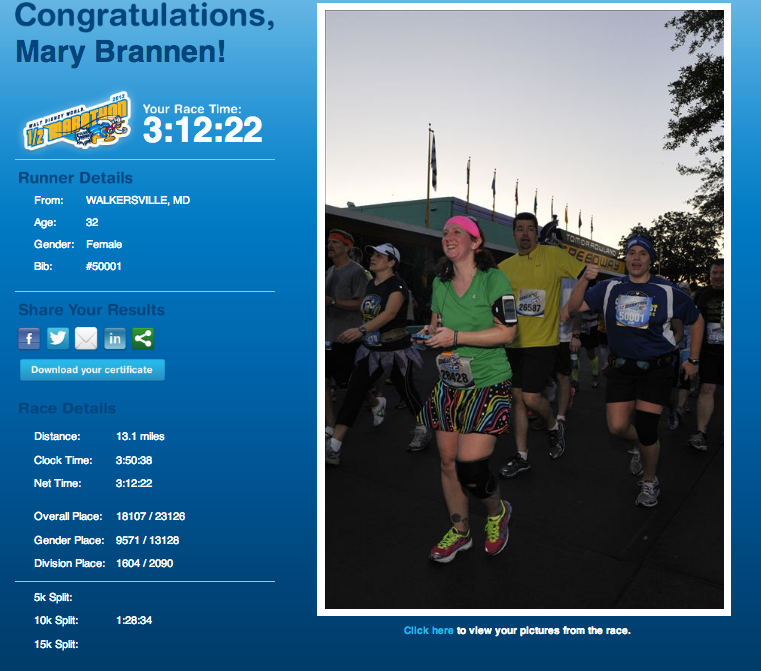 Like, whoops…you tripped and ran a half marathon last weekend too? Pretty close, it all started Friday night when I met some friends at DHS. I was originally down in Florida to run the full marathon with my friend Lori as I had been coaching her throughout her Goofy training and knew it would be nice to have me along for the moral support for the last 26.2 miles. I met Lori and a host of others at the 50s Diner as they were finishing dinner. Another friend of mine, Julie, was going to go watch Fantasmic. Her friend, Mitch, was down to run with Lori as well. 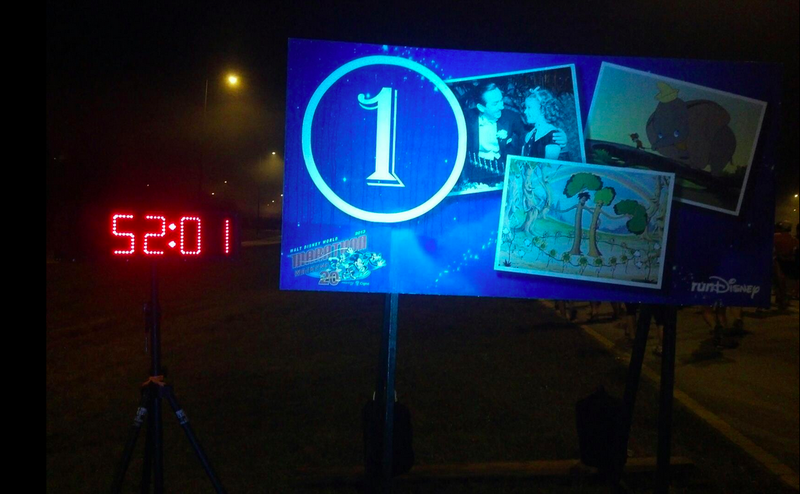 Mitch’s wife, Mary, wasn’t able to come down but had signed up for the half marathon on Saturday…so, there this extra bib for the half marathon just lying around with no one to give it some love. In steps Brian and the rest is 13.1 miles ago. 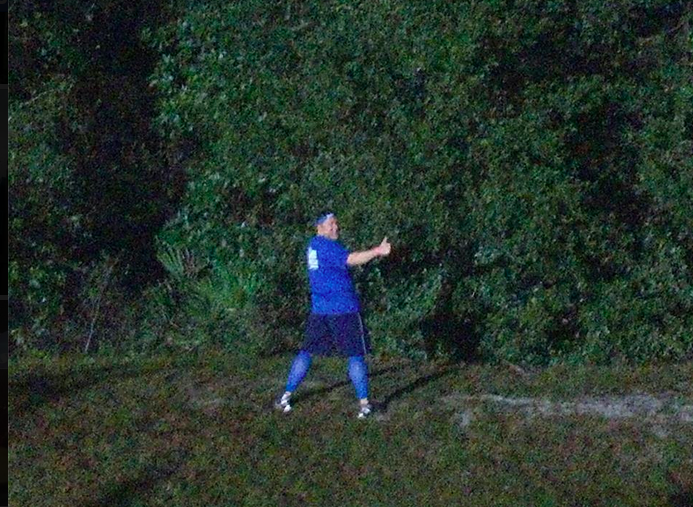 On Saturday I was “Mary” for about three hours running along side Mitch and Lori and another friend Matt. Talk about good times! 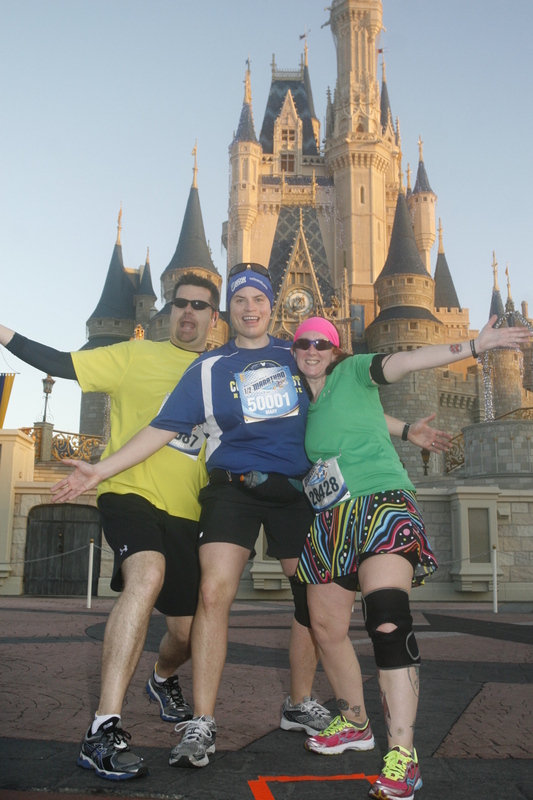 It was a non-stop running laugh fest across 13 miles of Disney property. Before I recap the two days of running let’s chit chat about the weather. It was hot. 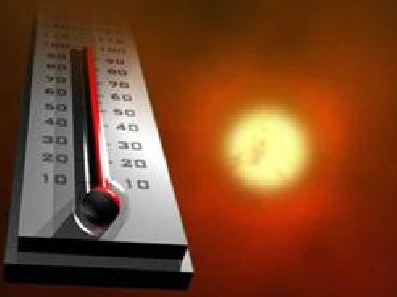 The Orlando area was experiencing temperatures 20 degrees higher than normal and increased humidity. Saturday wasn’t as bad since we were finished mid-morning before the temperature had risen too high, but Saturday was smokin’! At one point the temperature was 85 degrees with 80% humidity. The heat and humidity slowed everyone down. And now, back to the recap! Luckily, I just happen to carry two of everything running related when I go to a race. Two pair of running socks, two pair of running shorts, two running shirts. I didn’t have two pair of shoes, but I was willing to go it on just one pair. If I had planned it I would have brought another pair so I could swap them for the two races. Friday night I went to bed and then went to the meeting area Saturday morning with a good four hours of sleep! 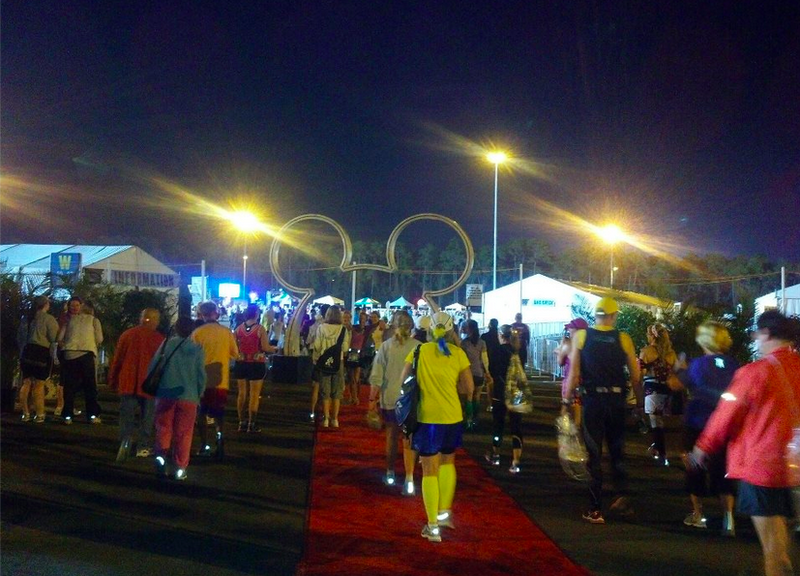 As always, runDisney had rolled out the red carpet for all of the runners. 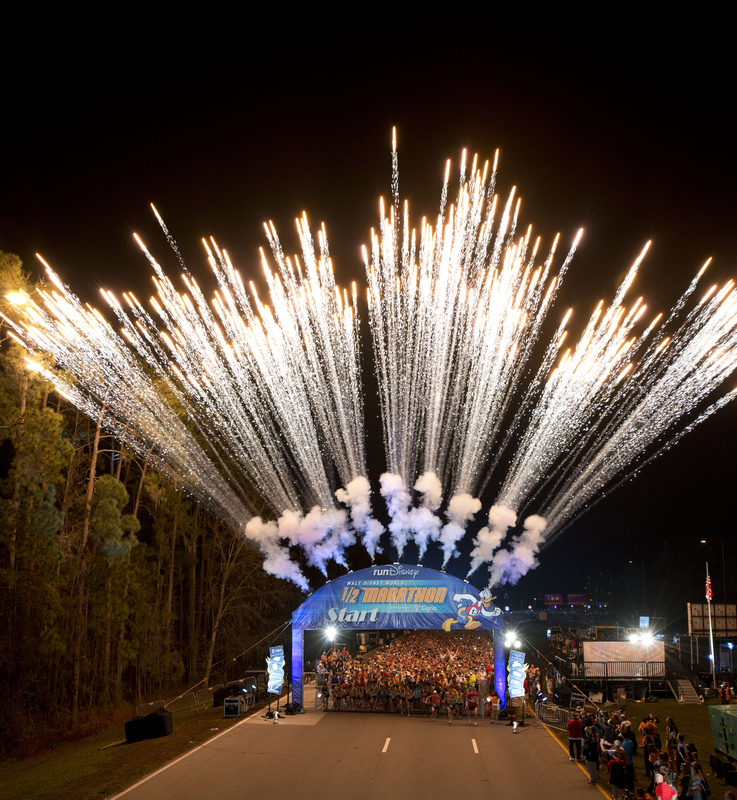 runDisney always rolls out the red carpet for me! Before long we were headed to the start line corrals. I was a little worried as the longest run I had completed was 15 miles. I had become sick with the flu the week I was supposed to do my 20-miler for Disney and missed it plus I hadn’t done any back to back long runs since last summer. 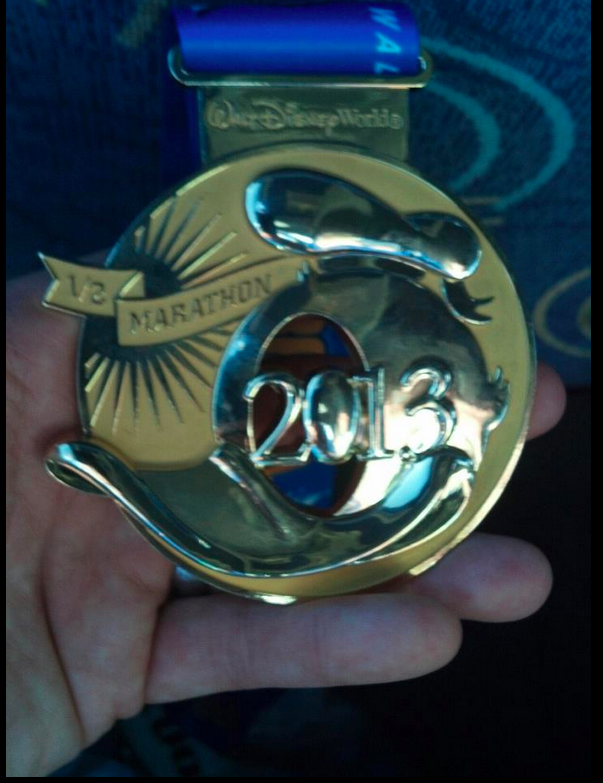 I knew I could do 26.2, but adding another 13.1 was, well…Goofy. One thing I did learn on the way to the start corrals is that porta-potties are not in the most opportune places! Tinkle Bell…when you gotta go! The next thing I knew we were ready to go for the first third of the journey! The 1st mile flew by even though we were taking it easy as a part of the strategy. We still had 38.3 miles to go. 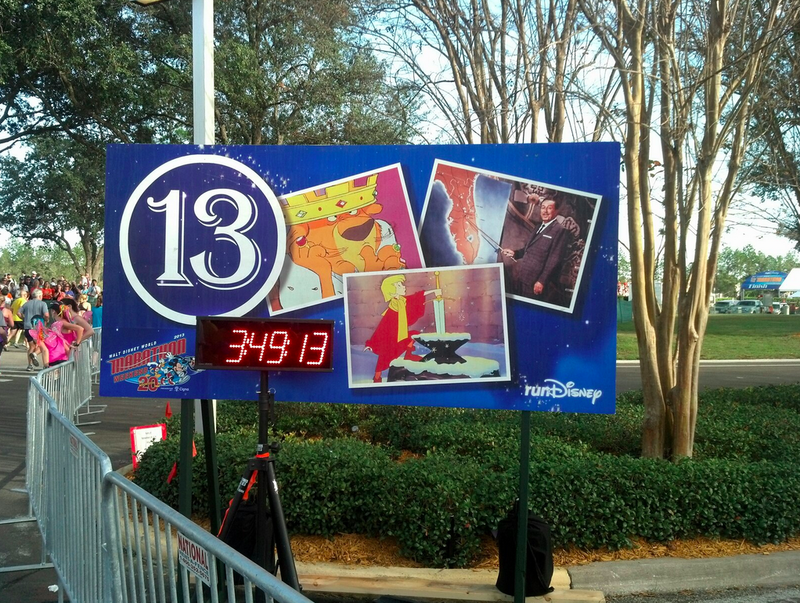 For the most part the half marathon was as I mentioned before a 13 mile laugh fest across Disney property. Four of us were running and keeping each other entertained as we went. We sang Disney songs, quoted movies, did impressions and even stopped and did push-ups for Sarge from Toy Story. Before long the last mile was whizzing by and we only had another 26.2 to go! A welcome sign on the half marathon day. After crossing the finish line I collected my (or Mary’s rather) half marathon medal! 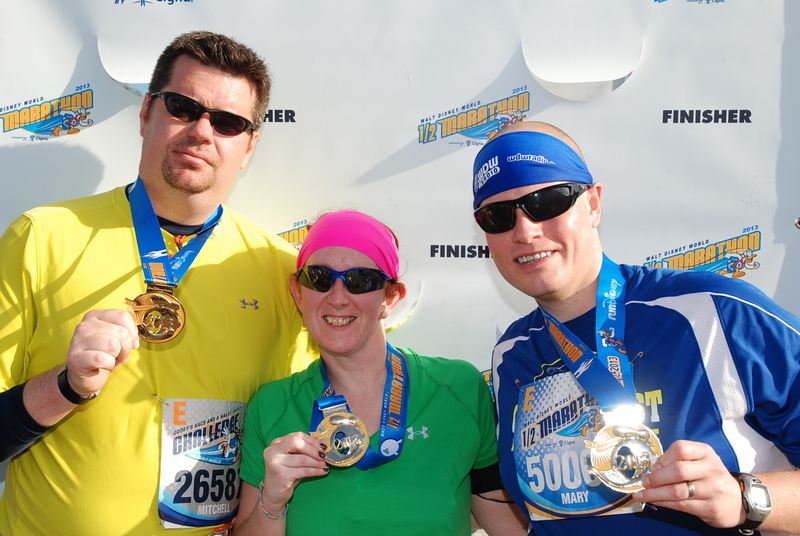 After snagging our medals we went over to get a picture taken. The sun was out and shining bright by the time we finished. It was time to head to EPCOT for dinner and some well earned libations before retiring for a little sleep and doing all again on Sunday. As my usual custom I did an ice bath before heading to EPCOT. As an update I just received my (Mary’s) certificate recently! That’s Mary on the right…in the blue. She’s cute! Hi my name is Bri…er I mean, Mary! Stay tuned for Part II of the Goofy Challenge Recap! Thank you! I did Goofy as a part of my C2C last year and it was very fun!